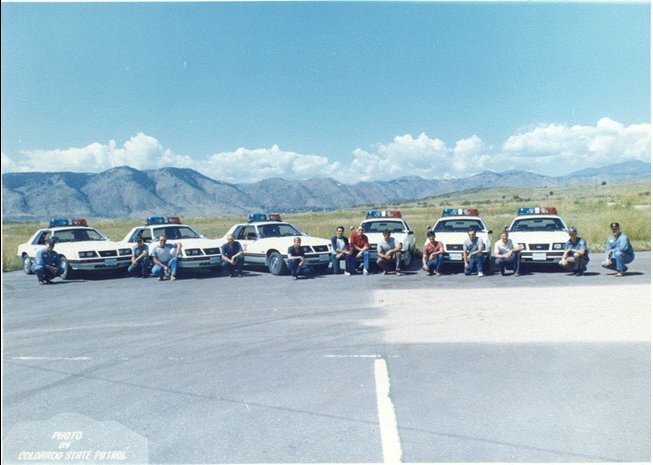 This is a picture from the Colorado State Patrol of all 6, 1983 Mustangs shortly after taking delivery. 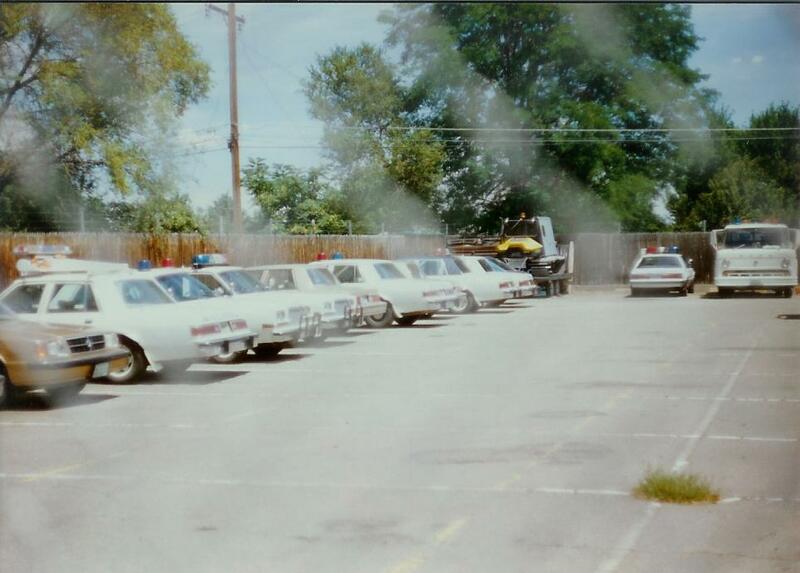 All Troopers assigned to these cars were mandated to attend training prior to driving them, and this picture was taken at that training. CSP photo. 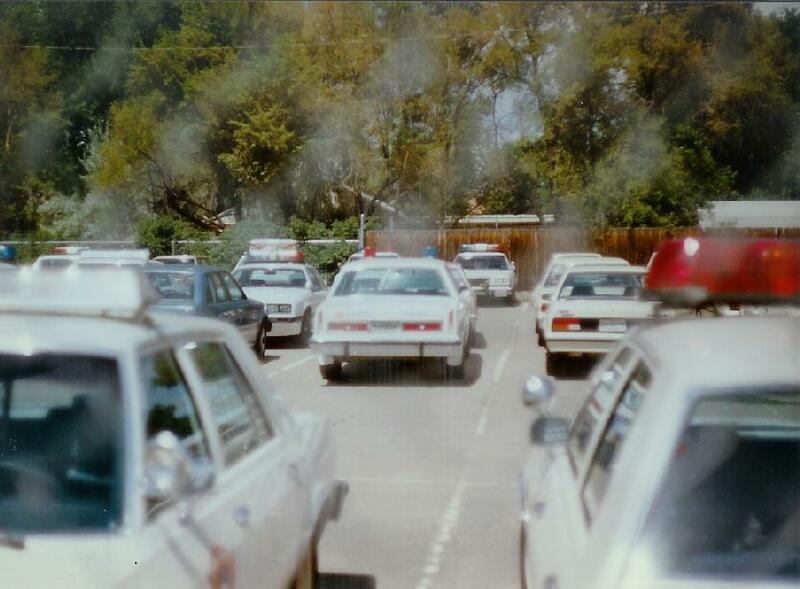 Another shot of the 6, 1983 Mustangs taken during training. 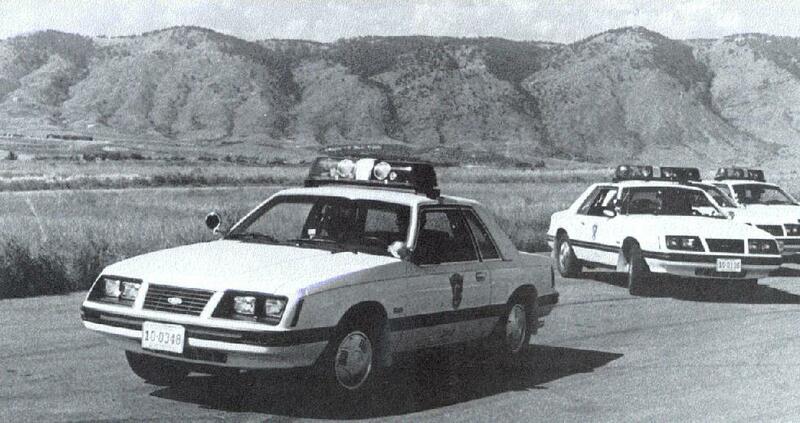 These cars were run with Whelen 80 Lightbars (inboard PAR strobes with outer halogen rotators) and a variety of full-wheel covers, which were added after delivery by the CSP. The Whelen 80/8000 series bars were one of the first strobe bars ever put into service. CSP also ran 5 inch spotlights on all of their Mustangs; drivers side clear, passenger-side flashing red. CSP photo. 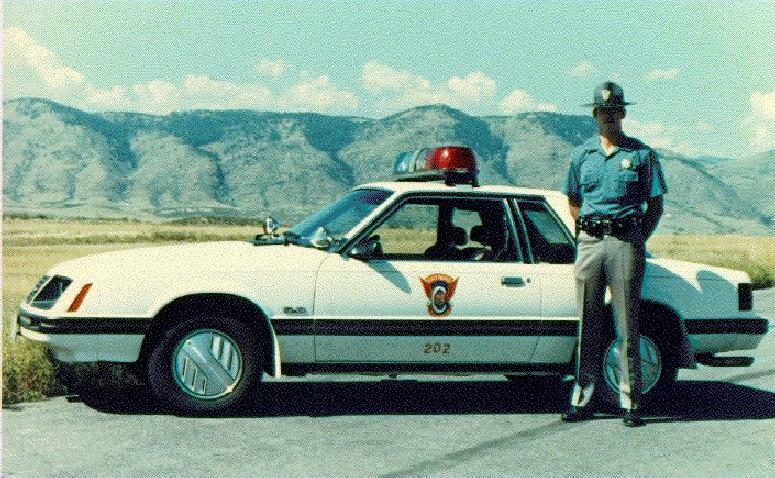 1983 CSP Unit #202, with Trooper Dennie Hancock, who was one of two Troopers assigned to this unit. 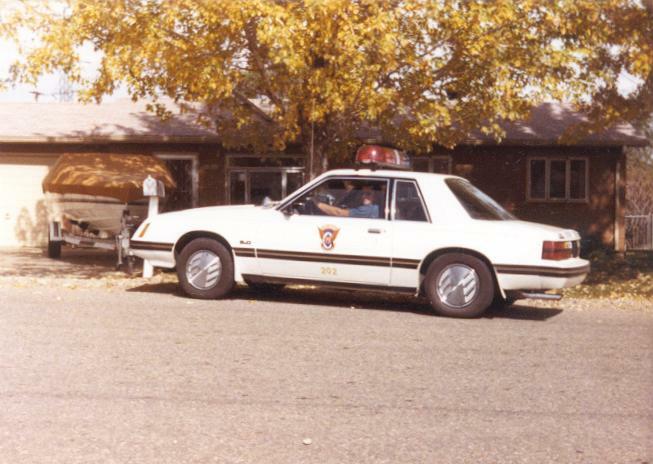 Another shot of 1983 CSP Unit #202. This was taken in front of Trooper David Harper's residence, who was the other Trooper assigned to this Mustang. Nice shot of a 1985 CSP, Unit #0029. The Whelen 80 bar is pretty tall, and Troopers reported problems with the large domes flying off of the bars at speed. This is also a good shot of the red, 5 inch spot on the passenger-side, argent center caps, and the door numbering for CSP cars. 1985 CSP, Unit #0029. 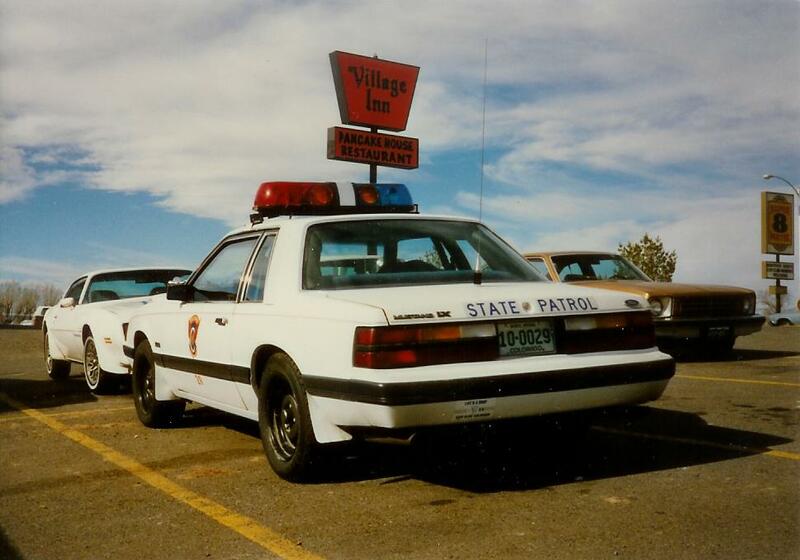 CSP moved the VHF radio antenna from a clip on the lightbar to the decklid on this '85. Another 1985 CSP, Unit #0075. This car does have the correct, argent center caps, but they are difficult to see due to the lighting. This one has the VHF antenna on the roof. Another shot of 1985 CSP Unit #0029. 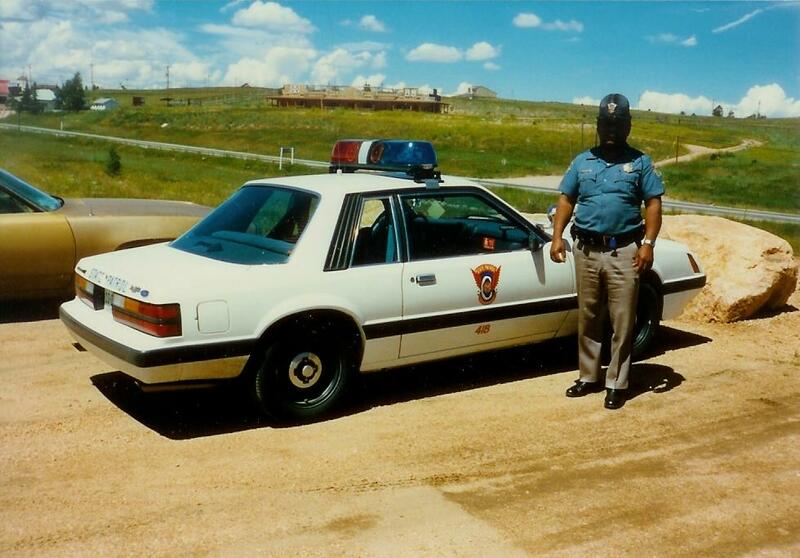 1986 CSP Unit #0418, with an unknown Trooper, 1988. This car has chrome center caps and the antenna is also on the roof instead of the decklid. 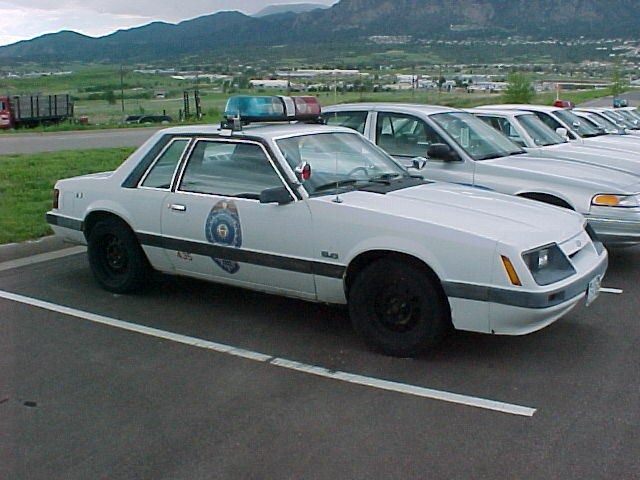 1986 CSP, given to Pikes Peak Community College by the CSP to use for their police academy after being retired from service. This car was sold in 2005 and was totalled in a crash shortly thereafter. 2004 photo. Another shot of the CSP/Pikes Peak car above. This is a nice shot of the rare Whelen 80 bar and also shows the antenna mount used on the earlier,'83 Mustangs. 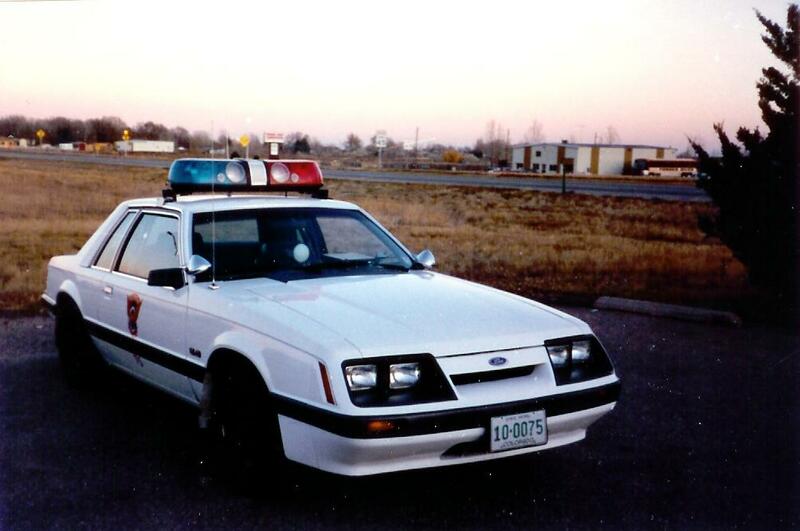 1986 CSP Mustang at CSP Headquarters, 1988. 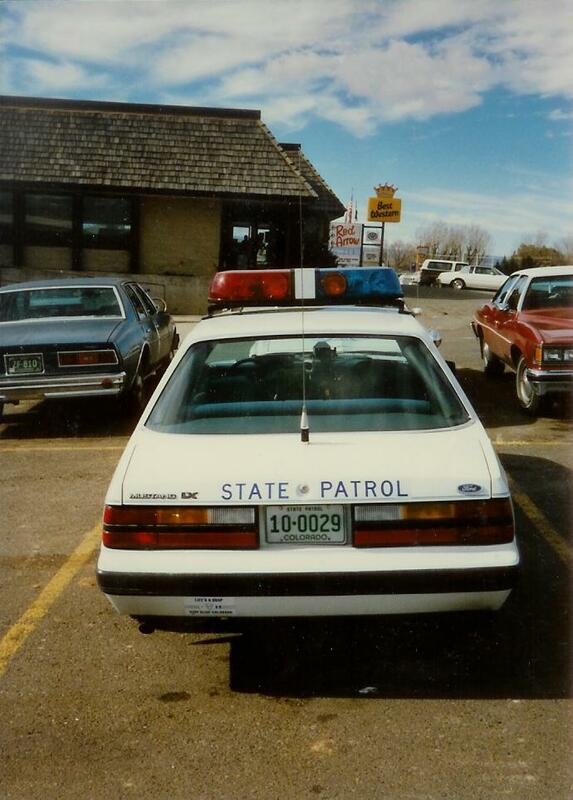 1983 CSP Mustang at CSP Headquarters, 1988. 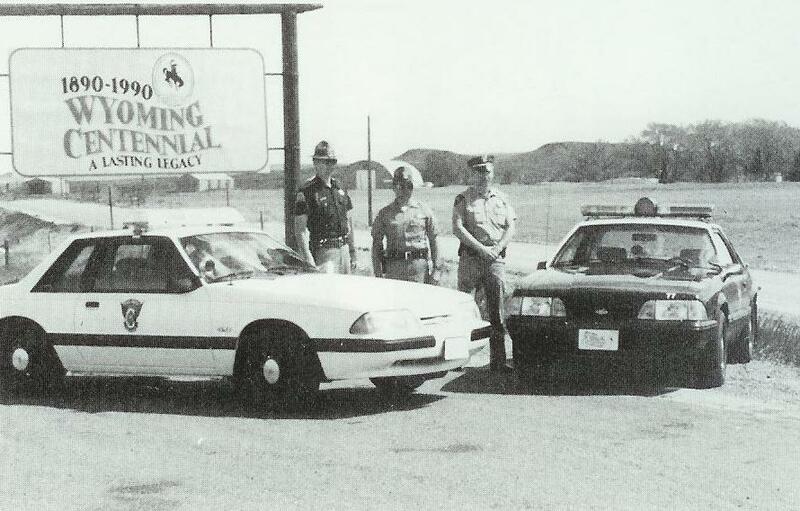 1987 CSP Mustang with a Wyoming Mustang (possibly a 1990 model). 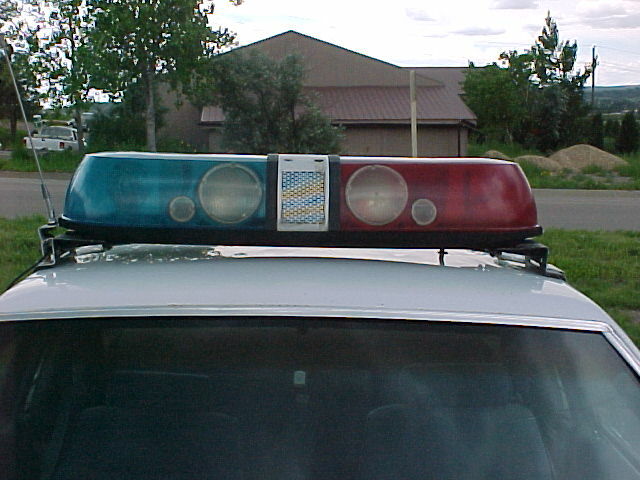 CSP installed Code 3 lightbars on the '87s. 1990 photo. 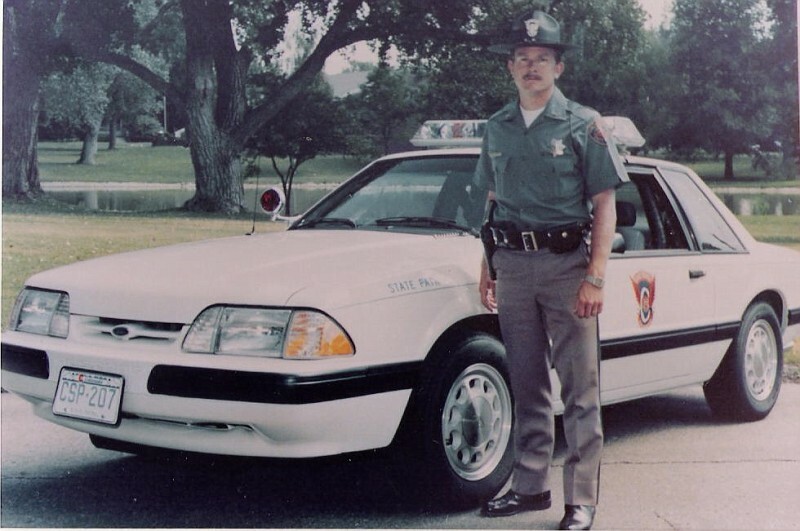 1990 CSP Mustang with a CSP Camaro. 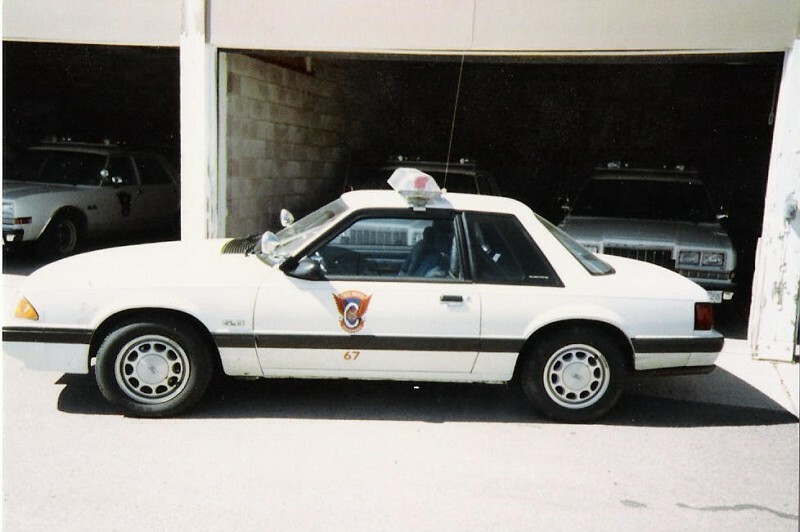 1990 CSP Mustang, Unit #207. 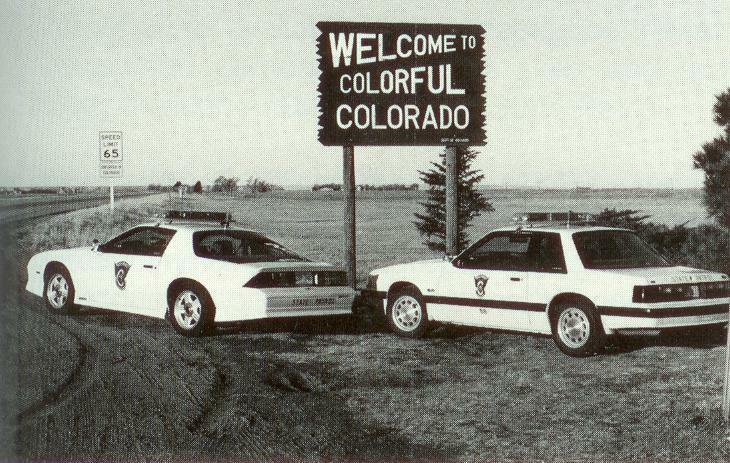 Colorado added "State Patrol" lettering to the fenders of the 1990 models. 1989 photo. E Prince photo. 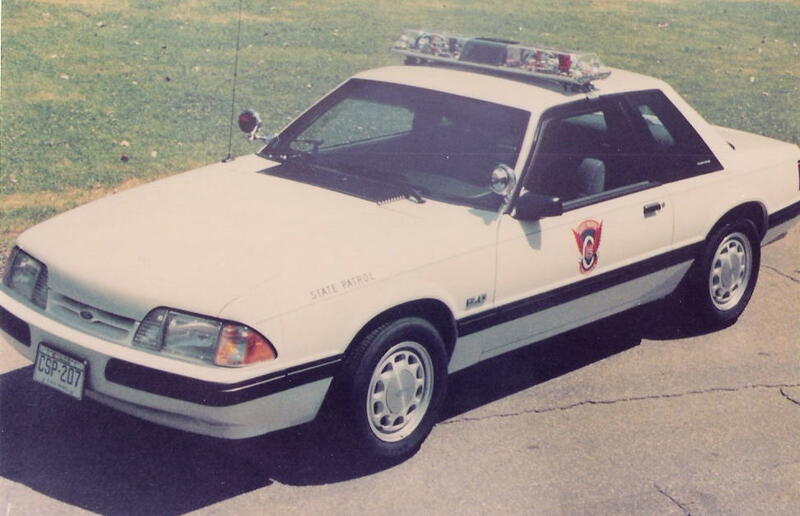 1990 CSP Mustang, Unit #67. 1990 photo. E Prince photo. 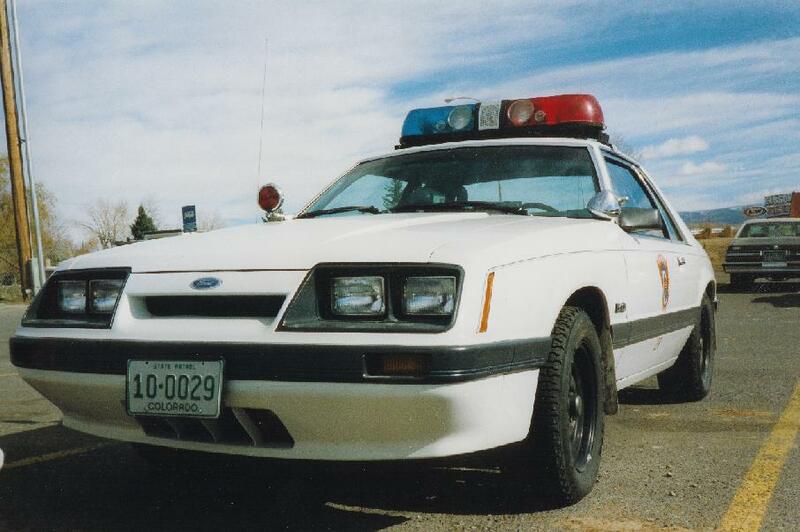 1990 CSP Mustang, another shot of Unit #207 (missing door numbers, for some reason). 1989 photo. E Prince photo.